There is a gingko tree in the courtyard of the Frank Lloyd Wright Home and Studio. It is over 100 years old, and is resplendent in autumn, when its leaves turn a radiant gold. Unfortunately, it is a female tree and produces abundant gingko fruit that has a notoriously foul odor. However, inside each fruit is a seed that is extremely delicious and prized as a delicacy in Japan – the gingko nut. The season for ginnan is autumn, when the emerald green nuts appear, skewered on delicate pine needles, or in chawanmushi (savory custard). 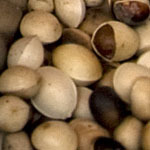 The nuts resemble pistachios and are roasted in their shells before the hard tan shell is removed. Inside, they are soft and slightly chewy, with an earthy and slightly bitter flavor. Roasted ginnan can be found at festivals – young men energetically shake steel pans over hot coals, handing out hot paper bagfulls. Each shell is thoughtfully scored to make it easy to remove. 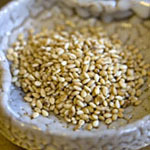 Available roasted, in black or white (actually beige), at Asian groceries, sesame seeds add richness and nutrition to rice, sauces, dressings, etc. Their flavor is enhanced by extra roasting, which can be easily and quickly done in a dry skillet. You can use either black or white seeds, depending on the color of the dish. For instance, for contrast, use black seeds in sushi, or when you don’t want to discolor a dish, such as tofu salad, use white seeds. Goma dofu is a decadently rich, silky “tofu” made of ground and strained sesame seeds thickened with kuzu, and black sesame ice cream is one of my favorites. We love mikan! These sweet, easy-to-peel tangerines make wonderful, healthy snacks and desserts that are enjoyed throughout the fall and winter months in Japan. During this season, they are conveniently packaged in tidy rows of 6 or 8 at convenience stores, local groceries, highway stops and train stations. Different regions grow different varieties of mikan, which ripen at different times, and some are larger and/or sweeter than others. I have many fond childhood memories of eating mikan on the train. They are also an important fruit for the Oshogastu New Year’s festivities, where they provide the third tier of kagamimochi, a traditional edible display. Nashi are now widely available in the US as Asian pear. Deep yellow and shaped like an apple, they have a crispy, slightly grainy texture that bursts in your mouth with the juicy flavor of pears. Since the skin is quite tough and grainy, it is usually peeled before serving. 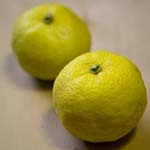 Nashi, like apples, discolor when exposed to air, so they should be freshly peeled and enjoyed right away. Japanese plum trees are among the first to flower, appearing in late winter. Seeing their delicate white blossoms is always a welcome sight, heralding the end of winter. Considered one of the three auspicious symbols of Japan, they symbolize strength and beauty, and have inspired countless poets and artists through the years. The fruit arrives in late May and June, golf ball sized, first green in color and ripening to yellow, with a reddish pattern. 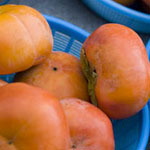 Notoriously sour, ume are never eaten raw. They are pickled and dried for umeboshi, or soaked in liquor and sugar to create ume shu (plum wine). 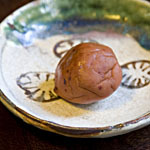 Umeboshi are often enjoyed at breakfast, where their mouth-puckering flavor awakens the diner, or at lunch in bento boxes, where the red circle in the middle of a rectangle of white rice represents the Japanese flag. 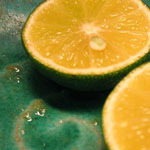 It has antiseptic qualities and is thought to aid digestion.